No need to stick to the exact traditional recipe for Dianne! Take this recipe for example. Still has Dianne sauce roots but so much better for a reinvented version. Anyway, who settled on using the name Dianne for a sauce, what's wrong with Sharon or Debbie? Peel and smoke the garlic using the wood chips in a pot for 20 minutes. Remove garlic and blend. Lightly saute the garlic puree then add the bourbon and reduce by half. Add the Worcestershire and water. Whisk in the KNORR Gluten Free Rich Brown Gravy and cream and whisk until boiling. 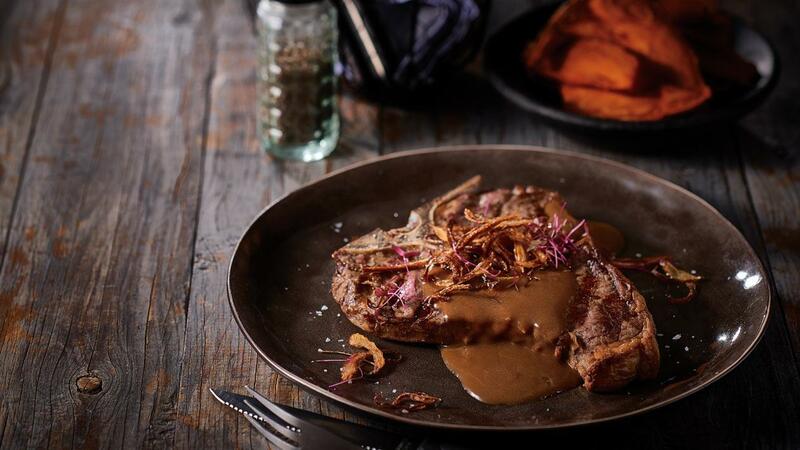 Pour the sauce over the steak and garnish with deep fried shallots.